One Thousand Names was inspired by, and was created as a component of a literary project conducted in conjunction with an exhibition by Sebastian Mendes. In 2011, New York’s Yeshiva University Museum mounted an exhibition by Sebastian Mendes, “There is a Mirror in My Heart: Reflections on a Righteous Grandfather,” a personal artistic response to the events of June 1940, when Aristides de Sousa Mendes, a devout Roman Catholic who was then serving as the Consul General in Bordeaux, France, acted against the explicit orders of his government and issued handwritten transit visas to thousands of refugees trapped in the area of Bordeaux between the Spanish border and the advancing Nazi army. These visas made it possible for bearers to pass through Spain and into Portugal and then on, as possible, to other countries and new homes. Over several days, in an assembly-line operation, thousands of documents were processed; the Consul signed each one, often to save time simply as “Mendes.” Historians have recognized the operation he initiated and led as one of the most successful single rescue acts of the Holocaust. It is estimated that de Sousa Mendes saved at least 30,000 lives. An ensemble of thirty 24” x 30” ink drawings of heavily superimposed writing, written over each other to create a palimpsest composed of a number, a refugee’s surname, and the signature of de Sousa Mendes as it would have customarily been written upon transit visas. In the gallery Sebastian Mendes undertook the continuous performance action of inscribing hypothetical and actual surnames representing the refugees who received transit visas from de Sousa Mendes. The drawing was created on a 7 by 7 foot surface Japanese Daitoku paper and on a large sculptural table designed to evoke the conjoined appearance and function of a massive consular desk with a functional drawing table. The artist invited any visitor who knows the name of a Holocaust victim or survivor to add them to his ledger book whereupon the name will be added to the drawing. As Aristide de Sousa Mendes was a religious Catholic (the origins of his own family roots go back to the inquisition when his ancestors were forced to convert from Judaism to Christianity), he prayed through a whole night with his wife as he reached his dangerous decision to grant the transit visas. A symbol of significance for Jews and Catholics, the installation includes a variety of suitcases containing “named loaves”—anglicized Jewish names branded into loaves of bread. 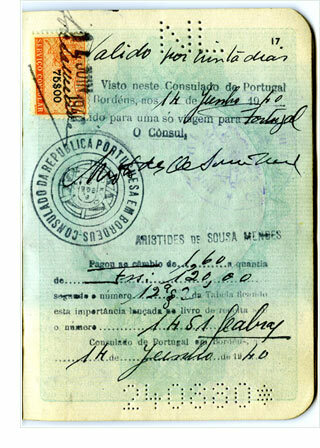 Above: Visa signed by Aristides de Sousa Mendes, 14 June 1940, Passport of Rose Frisch (Sax), courtesy of Helen Sax Potaznik. Photo courtesy of Yeshiva University Museum, New York, 2011.